Green Lanterns Hal Jordan, Guy Gardner, Jessica Cruz, Kyle Rayner, and Kilowog deliver the people of Penelo to a new world suited for the people. Guy believes that Simon is a traitor, and Hal is unsure. Of course, Jessica is unwilling to accept this. On Earth, Simon Baz believes he is freeing Superman from a trap in the Fortress of Solitude orchestrated by Brainiac. In reality, Cyborg Superman waits within. Sure enough, Simon gets through, and Cyborg Superman attacks. 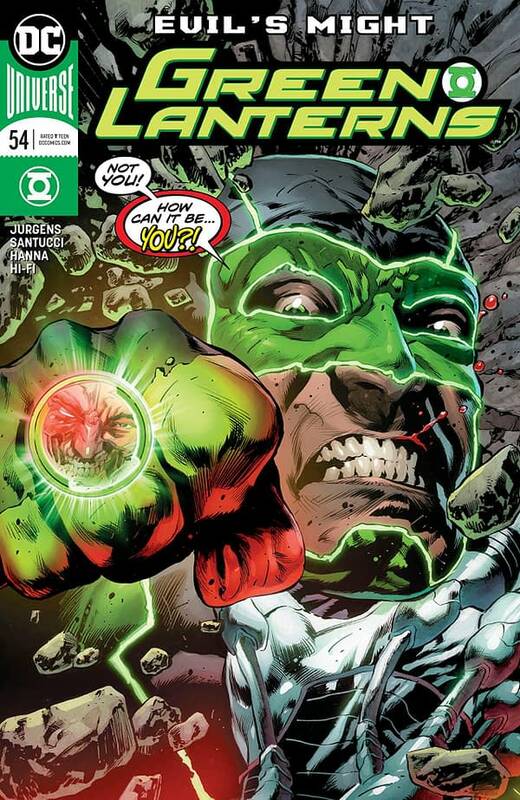 Green Lanterns #54 finds Simon Baz in the position of going one-on-one with Cyborg Superman. Naturally, that doesn’t go so well for Simon. Plus, Hank Henshaw has one more surprise for Simon and the reader that makes Simon’s situation that much more dire. 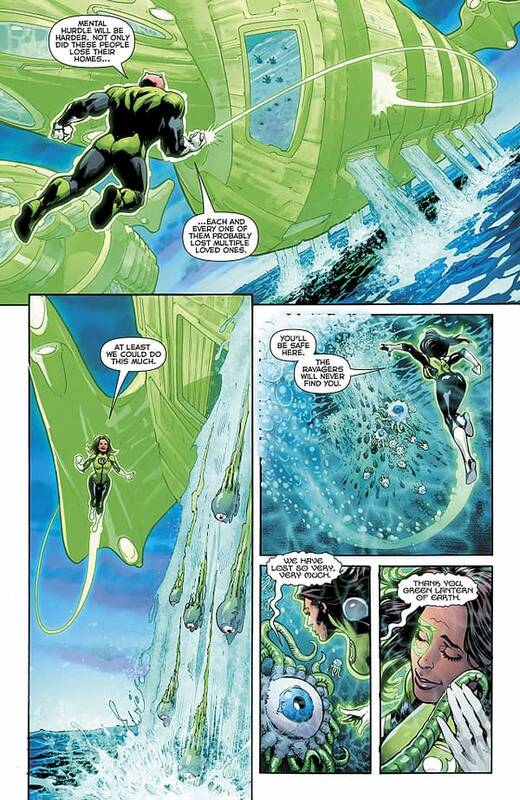 The opening scene with the other Green Lanterns serves to further raise the stakes by showing that the other members of the Corps aren’t sure of Simon and that he doesn’t necessarily have backup. The battle between Simon and Henshaw is almost depressing. Cyborg Superman completely shrugs off all attacks, and he goes out of his way to let Simon know how badly he has failed. The fight sequence is decent. It’s one-sided, as I already said. Marco Santucci’s artwork falters a little when characters are framed from a certain distance, and that is a problem throughout the book but is exacerbated in the Simon and Cyborg Superman fight. The inking, performed by Santucci and Scott Hanna, worsens it to a point because it’s thick and overwrites some of the detailing. 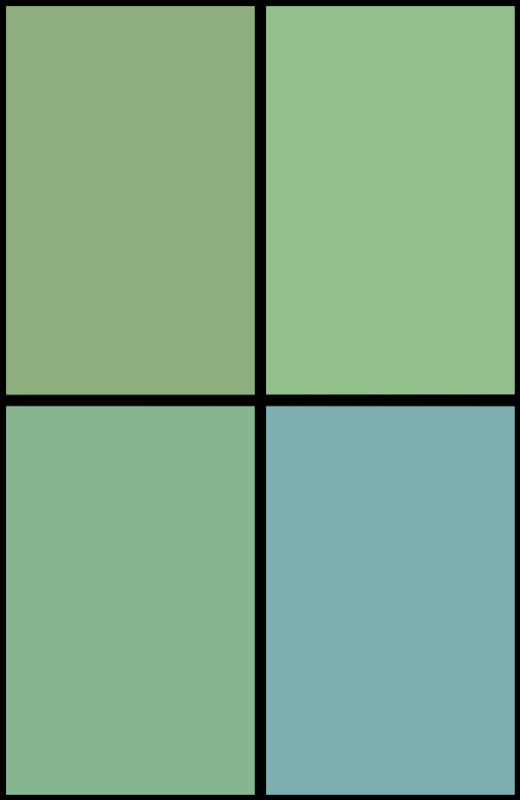 Hi-Fi delivers some solid color work though; the palette is a nice balance of deep greens and vibrant blue backgrounds. Green Lanterns #54 is a solid read. It didn’t excite me as much I had hoped given the premise, but the book still delivers a solid read that brings a Green Lantern to blows with the villainous Cyborg Superman. The book is worth a recommendation. Check it out.